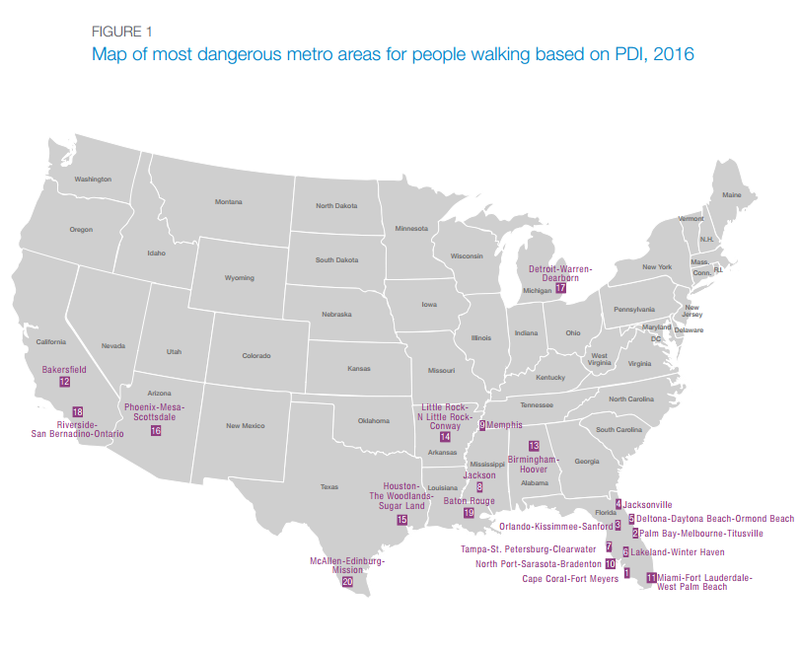 Smart Growth America just released its 2016 Dangerous By Design Report, which examines pedestrian crash fatalities from 2005 – 2014. If fatalities for people IN cars is getting worse, it doesn’t bode well for the most vulnerable users of our streets — pedestrians. Personal car ownership is lower among those demographic groups, so they are likely to be walking more. 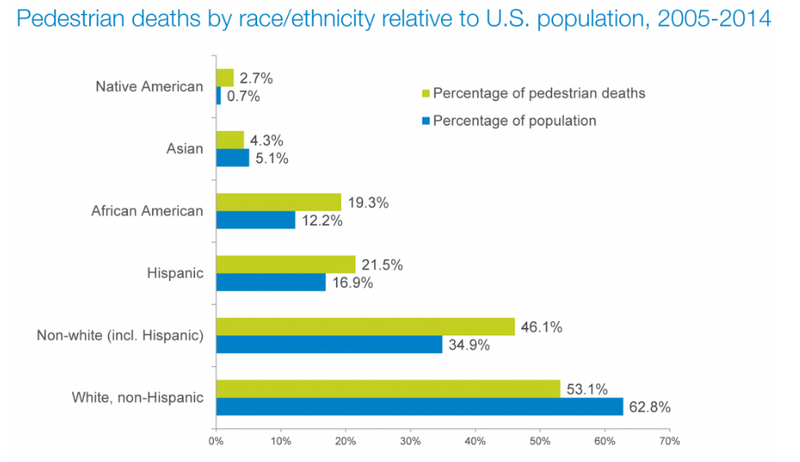 But here’s a more important point: “Poor neighborhoods and communities of color also have some of the most dangerous pedestrian infrastructure.” So it’s not just about more people walking. It’s also about more people having to walk in areas that aren’t safe for pedestrians. People have to walk along poorly designed roads meant for high-volume and high traffic speeds because they don’t have a choice. That means that streets are not designed to serve everyone in the community. To learn more about why that latter point is so pertinent to Rochester, where 34% of the City’s population lives in poverty, please take a look at Reconnect Rochester’s series on Transportation and Poverty. The common characteristic of the top areas is that they are mostly newer, low-density areas where people commute by foot less. How Does Rochester Stack Up? Out of 104 cities, Rochester ranks 14th for pedestrian safety (slipping from 9th previously). The good news is that Rochester’s Pedestrian Danger Index score improved from 33.97 in the 2014 report to 29. There were 113 pedestrian deaths from 2005 to 2014. The bad news is that doesn’t include this past year’s tally of pedestrian deaths on Lake Avenue and other roads. There are more than 500 crashes involving pedestrians and cyclists in Monroe County each year. We clearly have more work to do. 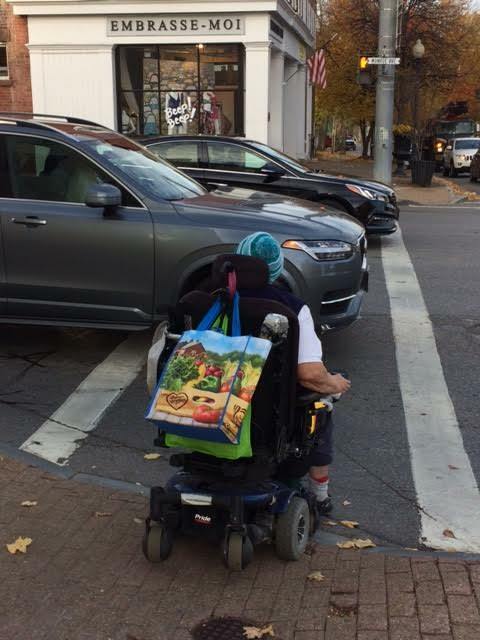 A common complaint heard when a pedestrian is hit by a car in Rochester is that he or she shouldn’t have been walking or crossing in that location. But we also know that many of our community streets do not have safe and continuous pedestrian infrastructure – and on busier roadways safe crossings are often few and far between. Many people on foot have little choice but to walk along side of, and cross those streets. The number one recommendation given by the Dangerous for Design report is to improve street design. Almost all car crashes are caused by human error — things like driving under the influence of drugs or alcohol, speeding, falling asleep and distracted driving. The impact of street design reached a milestone this month as a New York State of Appeals case found New York City 40% responsible for a crash involving a 12 year-old boy on a bike in 2004. The driver, who pleaded guilty, was driving a minimum of 54 mph in a 30 mph zone when he hit the young boy. The responsibility begins with all of us who walk, drive, ride, roll and vote. Pay attention and give input when your community is updating its Active Transportation and Comprehensive Plans. When you receive a notice about a road project or new development in your neighborhood, read about it and attend public meetings if you can. Ask questions, speak up and participate. Our community streets are for people. And in the meantime, remember that in spite of having to trudge through wintery streets in Rochester, be grateful you aren’t a pedestrian in Orlando. For almost 33 years, I reside in the area of Rochester, N.Y. then I really experience the close calls with the careless, and speedy drivers who is on cell phone lines as I make the narrow esacpes in action so quickly as I greatly use the vision to watch out despite of congenital deafness in quick thinking. I strongly remain on self-defense to look out the speedy cars through the red light as many speedy drivers don’t comply with the state traffic laws and traffic regulations. When I was young at my age, my late close uncle who was our family physician with his Ph.D. and M.D. degrees had taught me as I was a very, close niece to him in a fact.